"Power's capacity for spinning seamless melodies is as crucial to these stylish performances here as his and Crawford-Phillips's virtuosity." "The players' enthusiasm is self-evident, and Power tempers his sweet, full-throated tone (listen to him soar from 2'00" into the Enescu) with a lovely inwardness in the quieter music." "Power is perhaps the outstanding British instrumentalist of his generation, and not only a viola player but, as this disc richly demonstrates, a violinist, too. Hans Keller long ago observed that the distinction is, anyway, fatuous. Power's viola sound has a notable seductiveness, a sort of electric sweetness, but his genius for phrasing is as effective in Benjamin's 1924 Violin Sonatina (more substantial than the title suggests) as in his searching 1942 Viola Sonata, the focus here. A virtuosic arrangement by the sonata's dedicatee, William Primrose, of Benjamin's 'hit', Jamaican Rumba, ends the sequence." The Sunday Times classical CD of the week. "[Viola Sonata] Power and Crawford-Phillips leave us in no doubt of the stature of this final masterpiece ... One of Power's most compelling recordings yet for Hyperion"
International Record Review 'outstanding' award. 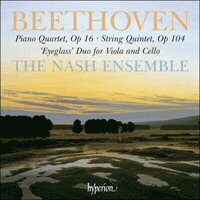 Sunday Times classical CD of the week. "[Double Concerto] Marwood and his viola colleague Lawrence Power prove to be the most outgoing soloists on disc so far ... There is an extra spontaneity here that helps give this youthful music a welcome lift. With the rich-toned Power returning to give an eloquent performance of Lachrymae, this disc offers a trio of highly characterful performances"
"This arrangement has been recorded several times ... but the Leopold's belated entry into the field eclipses all others ... the hushed withdrawing of the Aria's ultimate reprise is spellbinding ... for listeners, there are times when holding one's breath is inescapable"
"Lawrence Power is the perfect advocate for both works, with his rich, warm, sensuous tone and flamboyant virtuosity ... Brabbins and the BBC NOW are in complete sympathy with his musical aims"
"Real musicality shines through ... Lawrence Power lends poignancy to the slow movements and tremendous drive to the fast ones, and the BBC SSO under Atherton gives those machine rhythms real relish"
"Power's performances - characterised by his trademark tonal richness and easy, almost nonchalant technical brilliance - leave no doubt about the weighty seriousness of the music, and its significance for Hindemith"
"Listening to Lawrence Power's committed performance of both works leaves one grappling for reasons for the comparative neglect of the Rózsa ... Power delivers a highly charged account of the solo part maximising emotional contrasts in the music to an even greater extent than the impressive Gilad Karni on a rival Naxos disc. The Bartók is equally compelling"
"The Nash musicians play everything so delightfully, with such perfect control and subtle shadings ... the String Quintet offers the best music: as for playing, the crown's won by Lawrence Power and Paul Watkins in the Duo"
"Not since the days of William Primrose have I heard Hindemith's viola music played with such warmth and conviction"
Class FM Magazine Instrumental disc of the month. "All the pieces show Bowen's love of the instrument's capacity to unfold long-limbed, rhapsodic melodies ... Lawrence Power's richly expressive moulding of them is a rare treat in itself"
"It is hard to remember, when listening to this superb disc, that the three works, Brahms's last, were written with the clarinet in mind. Power is among the most persuasive instrumentalists of our day, and, with his unremitting eloquence, could make you believe the viola was a trombone, but his communicativeness is a matter of the deepest feeling." "This new performance [Bowen] is beyond criticism ... the performance [Forsyth] is everything one could desire and the recording is wonderfully ripe and glowing to match. 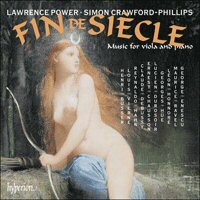 A fascinating coupling: hearty congratulations to all "
Whether playing his viola or violin, Lawrence Power is in total sympathy with Benjamin's shifting moods, and Simon Crawford-Phillips proves a lithe and responsive piano partner. A bouncy recording and excellent inlay notes offer more inducements for listeners to discover that the Jamaican Rumba man, composer of five operas and a powerful symphony, was far from a one-trick pony. Power's exploration of the viola repertoire grows ever deeper, and this is one of his most compelling recordings yet for Hyperion. Power's raptly beautiful account of the mysterious Lachrymae ... is a final bonus. His playing impresses by its aplomb in the face of passagework that takes him to the upper reaches of the viola, without for a moment compromising the beauty of his tone ... 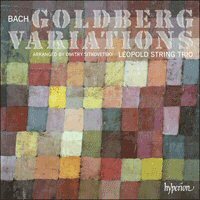 This CD can take its place alongside Power's benchmark recordings of the concertos by Bowen, Forsyth, Rubbra and Walton.